Angela Garbacz’s passion for pastry began at a young age and led her to study culinary arts and food science at the French Culinary Institute (now the International Culinary Center) and University of Nebraska–Lincoln. After discovering she had a dairy intolerance, Garbacz decided to use her knowledge of ingredients and classical techniques to craft beautiful, delectable sweets that catered to a variety of restricted and alternative diets. She started a blog to document her foray into what she calls “inclusive baking,” and Goldenrod Pastries was born. 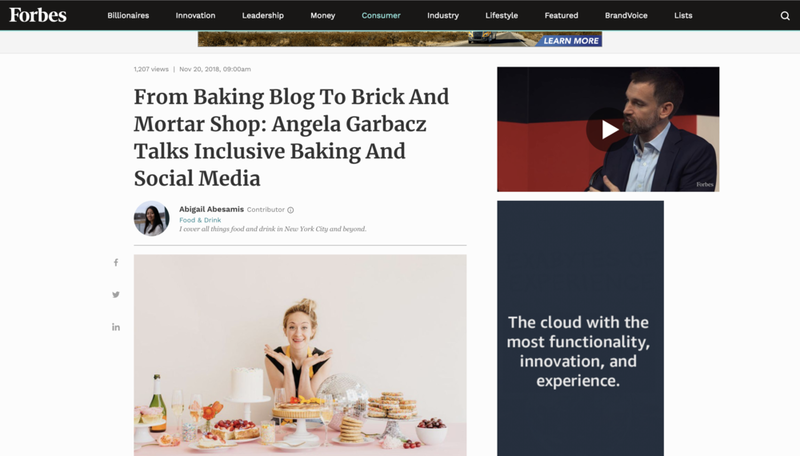 The blog’s popularity prompted Garbacz to devote her life to pastry full-time and shift production from her home kitchen to a Goldenrod Pastries brick and mortar store in Lincoln, Nebraska, which opened its doors in the spring of 2015. Abigail Abesamis: Tell me about gluten-free baking. What are the limitations and what are the substitutions you typically use in place of wheat flour? Angela Garbacz: I had to do a lot of experimentation when I first started baking for gluten-free diets. This meant learning about flours and how they react in different recipes. I ended up trying a lot of starches, flours and gums, but ultimately preferred to work with premade blends by reputable gluten-free flour companies. This was much more cost-effective as I started experimenting, and I could access their databases for how they recommended using their flours. It can be really cost prohibitive to buy lots of different individual flours and starches to experiment, so I always recommend that people start their gluten-free baking experimentation with premade blends. Abesamis: What about dairy-free and vegan baking? Garbacz: When I started researching dairy-free and vegan recipes, it was really common to find recipes that omitted fat or quite a bit of sugar. I never set out to create “health” food and quickly found that keeping in traditional amounts of fat and sugar kept recipes tasting traditional and desirable to most palates. I use a lot of coconut oil, coconut milk and almond milk. A lot of dairy-free and vegan recipes use egg replacers and other thickeners, but we prefer to develop recipes that omit any replacements and exist well on their own. Abesamis: Tell me about some of Goldenrod’s most popular menu items. Garbacz: Our morning buns are definitely the most popular items in the store. When Goldenrod opened, I was just making cinnamon rolls but personally, breakfast rolls have always been really fun and special to me... so I slowly expanded the menu and our customers got excited too. We have about seven different buns we sell during the week – most are vegan, and many are gluten-free and dairy-free. Our pound cakes and cookie sandwiches are also super popular, as well as our custom order cakes. We have a daily selection of 25-30 different options, which rotate throughout the seasons. Our current seasonal favorite has to be the dark molasses cookie sandwiches with vanilla buttercream. Abesamis: Is your customer base mostly comprised of people with food sensitivities and dietary restrictions or does Goldenrod have a more general appeal? Garbacz: Our numbers fluctuate, but it’s typically a 50/50 split of customers who need (or prefer) to eat a certain way versus those who have completely open diets and can eat anything. At first, I was afraid of only appealing to one audience or the other, but after working diligently to create these recipes we have been able to create a product with broad appeal. I think it is an ideal place to be – baking a menu that is inclusive to those who need or want to eat a certain way, but that also appeals to people who can eat anything. We call this inclusive baking! Abesamis: So what’s next for Goldenrod Pastries? Garbacz: At this time, I see a lot of power in having one location for Goldenrod. I haven’t found or created the perfect expansion opportunity yet... but it isn’t out of the question in the future! I have invested a lot of energy and resources to expand the Goldenrod brand in the past year and am working to create more media opportunities and attention not only to Goldenrod but to inclusive baking as well as the growing markets in the middle part of our country. Abesamis: Tell me about the role social media has played in your business, from when you first started your blog to now. Garbacz: I started Goldenrod from social media. This allowed me to tell the story of starting a business, working from home and building the brick and mortar location. I’ve always thought that including your customers on the journey of your business is so important and valuable. My early blog posts and social media presence really told that story and is, I believe, why Goldenrod had such a large following when it first opened. Today, we continue to share stories and our daily work through Instagram and Facebook, and it continues to be our main source of marketing. Preheat your oven to 350 degrees F and have a 9” pie tin ready to fill. Combine all ingredients in a mixing bowl and mix until combined. The mixture should form a loose mass when you squeeze it in your hand. If it seems too wet or too dry add more flour or coconut oil, respectively. Press dough into the base and up the sides of your pie tin. If the dough is sticking to your hands, you can put a little water on your fingers and continue pressing. It can be a little messy sometimes! Bake in your preheated oven until the crust starts to get nice and toasty, about 15 minutes. While the crust bakes, make your filling. You can make the crust up to five days in advance – just wrap it well and keep it in the freezer. Whisk together all of the ingredients until everything is well combined. Pour mixture into your pre-baked pie shell (the pie shell can be warm or cool when you pour in the filling) and pop back in the oven for about 45 minutes, or until the pie is set through the center. You will know that it is set when it no longer jiggles and the top will have a more matte look to it. Let cool in your fridge for at least four hours prior to serving. This can be served as is or with coconut cream*. Refrigerate the cans of coconut milk for at least 24 hours. This allows the cream layer to separate from the coconut water. Open the cans of coconut milk and carefully scoop out the top layer of cold, solidified coconut milk into the bowl of a stand mixer fitted with the whisk attachment. Reserve the remaining water for another use. Add the vanilla extract and mix on medium-high speed until most of the lumps of coconut fat have broken up and soft peaks have formed, about 5 minutes. Refrigerate or use immediately. You can make this up to five days in advance – just store in an airtight container in your fridge.